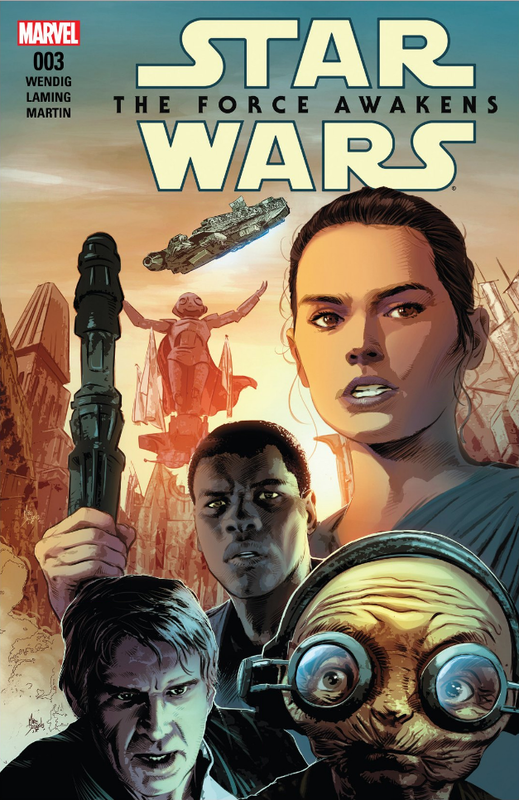 Star Wars: The Force Awakens #3 continues the comic adaptation’s journey from Rathtars to Luke’s lightsaber. Chuck Wendig continues to do a good job of parsing the film down to the essential dialog and scenes to convey the story. However, Marvel made an interesting move in changing out the artists for the title. Gone is Luke Ross and in his place is Marc Laming. In my opinion, it’s definitely a change in the right direction. The dialog and the pacing of this issue is pretty much on par with the previous two issues. This is very much a straightforward comic adaptation without extra scenes and dialog. While there may be tweaks in the dialog, it’s more to save space and time than to add anything extra. As such, Chuck is continuing his knack for translating all those scenes and dialog into the minimum needed to convey the story. That said, I’m curious how the mini-series is going to manage to wrap up the rest of the movie in just three more issues. 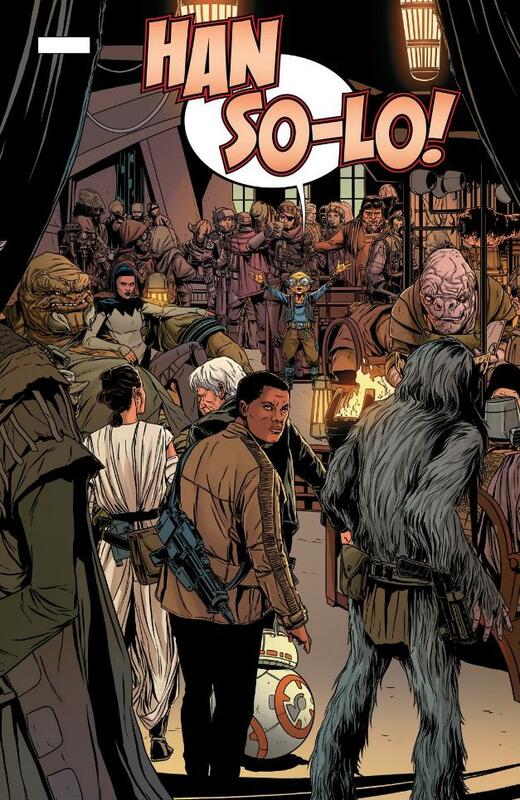 This issue ends just as Rey finds Luke’s lightsaber in Maz’s castle. That means the next issue will have the honor of depicting her dream sequence, which could be the biggest payoff of the whole series. But there’s also the battle on Takodana, the destruction of Hosnian Prime, the Resistance base planning scene, the battle at Starkiller base, the return to the Resistance base, and finding Luke. 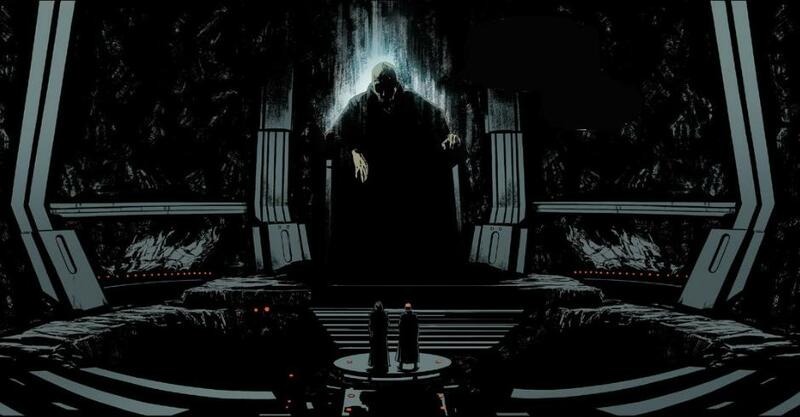 Of those, the biggie is the battle at Starkiller base as a lot happens there. 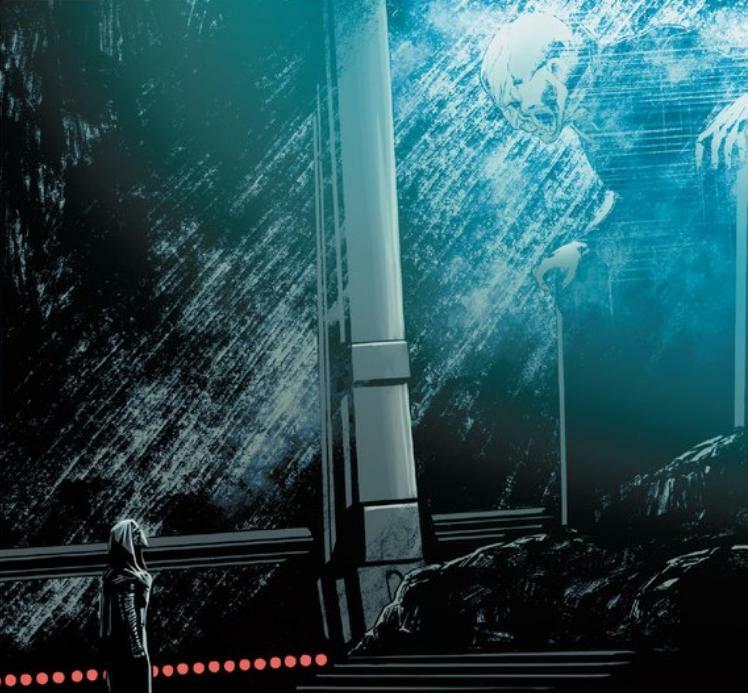 The key will probably be getting issue #4 up to the Starkiller base battle so issue #5 can focus on it entirely, and thus leave issue #6 with enough room to finish the battle and reach Luke. It’ll be interesting to see how Chuck pulls it off. Aside from the story, the change up in artists is very interesting. Marvel’s comic solicitations for this issue and the following three all listed Luke Ross as the artist. With Luke being replaced in this issue, it brings up the question whether he’s gone from the rest of the series or whether he’ll be back. There certainly doesn’t appear to be any hard feelings on Twitter as Luke retweeted Marc’s artwork. Personally, I’m happy with the change up. Art can be a very finicky thing, with everyone having their own tastes, and Marc’s style is much more to my liking. In contrast to Ross, he uses a lot more detail and it gives the reader more to look at in each panel. 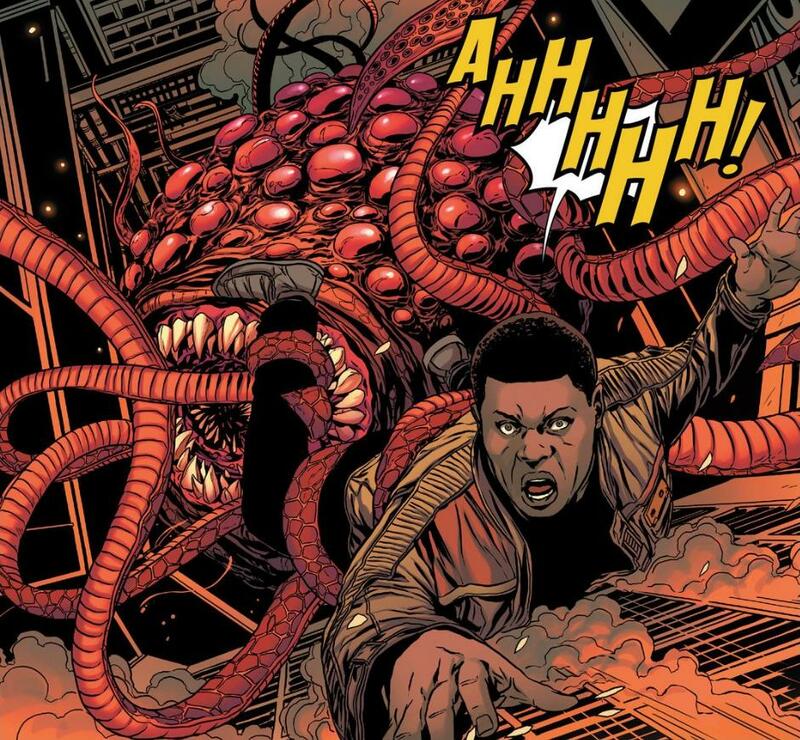 From the snarling mass of Rathtar tentacles, to the myriad mob of characters in Maz’s castle, there’s a lot to enjoy. The castle scene is definitely a highlight as each of the background characters is given considerable attention to detail. Rather than just zooming by those panels, you can stop and drink them in for all their worth. However, the biggest highlight for me was the Snoke scenes. 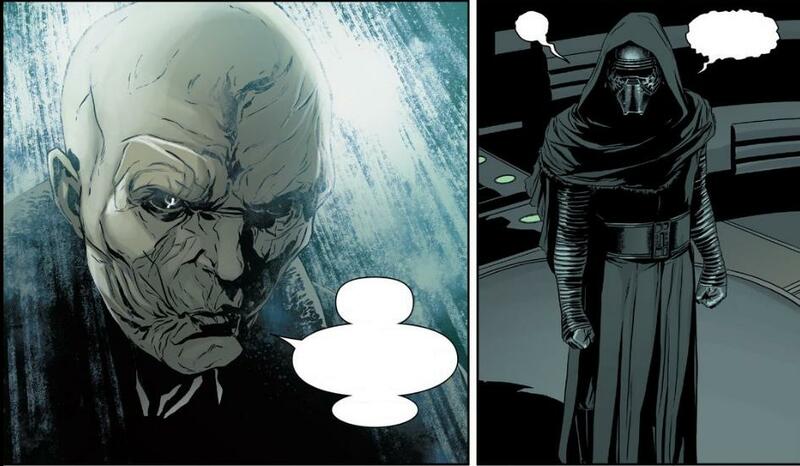 We haven’t seen much of Snoke, and Marc did a good job of bring him to life in the panels. I really like the way he portrayed the lighting as an artistic effect versus simple computer effects. It’s adds a nice intrinsic value to the panels. Hopefully Marc will be around for the upcoming issues as I’d love to see his take on the Kylo versus Han scene on the bridge and the forest battle against Rey. With a boost in the art department and a good job with the storytelling, I give this issue a four out of five metal bikinis. If you haven’t been picking up the issues for the mini-series, this one is worth a look for the artwork, whether you buy it or not.